I truly appreciate the friends, relatives and strangers who for one reason or another have read through my novels before publication and offered suggestions and back-up proofreading. After I published c3 I came upon a way to say thanks. I made t-shirts. It seemed like kind of a goofy thing to do, which I suppose is why I liked the idea so much. I didn’t want the shirts to contain blatant advertising — that’s not exactly a gift, is it? — but rather to be something fun that tied into the whole 46. Ascending collection idea. 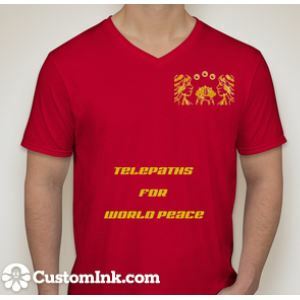 I finally settled on the shirt shown above, inspired by the first novel in the collection, x0. Well, it’s a year later and now I’ve got thirteen folks reading the almost final version of the soon-to-be-published novel d4. Nine are first time beta readers. Eight are people I’ve never met in real life and probably never will. How does one thank nine women and four men with ages that range from early twenties to late sixties and who call six different countries on three continents home? Easy. You send them a t-shirt. At least I hope that the shirt to the left, inspired by the novel z2, will make them every one of them smile and will even start a few interesting conversations for each of them. 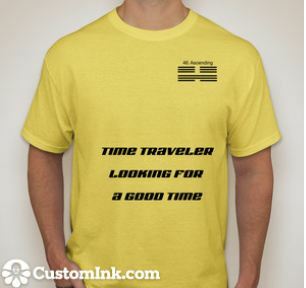 Yes, I would like to do a t-shirt for the intermediate novel y1 as well, in a suitable chameleon shade of orange, but the right tag line just would not come to me so I skipped on to the next book. Perhaps someday a clever reader will suggest the perfect words. And of course there will eventually be a green tee inspired by the intrepid Teddie of c3. Those who have heard me complain about how much I hate marketing my books may notice how much fun I am having creating these little thank you gifts. It’s true. I like doing this. It goes to prove that there at least some marketing skills that even a strong introvert like me can embrace.